Manila Water Foundation (MWF), Clark Water Corporation (CWC), and partners officially turned over a water tank project that allows and IP community in Sitio Haduan sustainable access to clean and potable water. 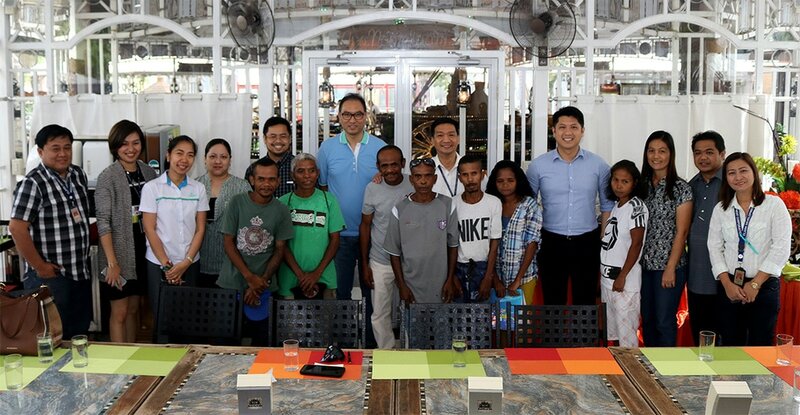 With the beneficiaries in this photo are officers from MWF, CWC, Clark Development Corporation, and the National Commission on Indigenous People headed by Manila Water Foundation President Ferdinand Dela Cruz (center, in blue). Manila Water Foundation (MWF), Clark Water Corporation (CWC), Clark Development Corporation (CDC), and the National Commission on Indigenous Peoples (NCIP) have recently fulfilled the promise that they have formalized last year as the water facility, which they have committed to an Aeta community in Mabalacat City, Pampanga, has been officially turned over. Inspired by the vision of the late Atty. Angelo “Sonny” Lopez II, the former Head of External Affairs Department of CDC who was known to have built strong ties among Aeta communities in the Clark Freeport area, the four organizations concretized this water project even after his untimely passing in 2015. Through the MWF-initiated Ahon Pinoy program, which aims to provide alternative access to water in areas where pipe laying is geographically impossible, a water tank that is directly connected to Clark Water’s existing water network was designed and constructed for the benefit of more than 200 Aeta residents of the community. The initial plan was only to rehabilitate the hand pump of the community. However, after several attempts, no water can be sourced out from the grounds of the mountainous area. So instead of pushing through with the original plan, CWC decided to upgrade the project into a full blown water facility which includes a pumping station, pipe bridge, overhead tank, and communal faucet. Although the project had a rough start, CWC General Manager Maidy Lynne Quinto shared that the challenges they have encountered were channeled into something more favorable for the community. Before the engagement, the community only relied on the water hand pump that they used to have. However, after it has been non-operational for years, the community was left with no option but to fetch water from the nearest creek to fulfill their water needs. This practice posed both physical and health risks, as the water quality from the said source is questionable. Upon receiving the facility, Sitio Haduan Tribe Chieftain Roy Tanglao can only utter words of appreciation and commitment to take care of it. To close the event, MWF President Ferdinand Dela Cruz paid tribute to the group’s motivation and inspiration to continue the project despite the unfavorable start.